Where Will the Artists Go? 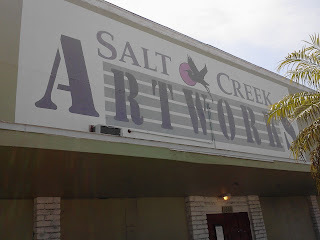 Salt Creek Art Works is closing soon. Salt Creek Artworks provides studios and galleries for "struggling" local artists. Some of them have been struggling there for a lot of years. The Tampa Bay Times reported the property has been sold and will be converted into a parking lot for the fish processing plant next door. Probably some irony in all of that. Hum the tune: They "Paved Paradise and Put Up a Parking Lot"
There is a lot of history in this place. Once the Perma House Furniture store, ART WORKS has been on 4th street South for 20 years or so. I have been to a number of art shows and fund raisers there, it is about what you would expect an art studio/gallery to be, comfortable, interesting and full of fascinating people. The big question is: Now what? Will the St. Petersburg arts community, so fond of itself and its accomplishments, promoter of St. Petersburg as an arts destination, step up and find a new location for this important art center, or will they come running to City Council for a hand out to help the starving artists. With the arts community never reluctant to dip into the public trough, look for the latter. It's time for Chihuly, the people who operate the Dali and some of the other more successful art operations in town to step up and help their struggling brethren. The City can help with zoning and permitting to make a relocation easier. With Mayor Foster looking at a $13 million dollar budget short fall, thinking about raising taxes and creating convoluted fees, it's time for the arts to help the artists. Last Thursday, City Council member Jim Kennedy laid out his recruitment plans for a new community based action group, St. Pete Together. The group will include people who live and work in St. Petersburg. Last time I checked Council people were selected by a district primary and voted on City wide by the people who actually live here and pay taxes. The objective was to elect someone who represented them. Council member Kennedy has been more than a little bit self serving in his tenure on City Council, and this whole St. Pete Together thing looks like could easily morph into a grass roots effort or a Political Action Committee in the Jim Kennedy for Mayor effort. It's also kind of interesting that a City Staff Member, Kewa Wright, is going to be Kennedy's point person for this effort. Is that really a proper use of City resources when the Neighborhoods can hardly get a seat at the table in City decisions and the budget is in shambles? Going down this road, can Rick Kriseman start the Legislative Friends of St. Petersburg Focus Group and request City a paid administrative aid for help, or how about the Rick Baker and the Committee to Develop the New Baker Plan. Do they get City supplied help? Or the Leslie Curran Global Initiative For the Arts in St. Pete? They will need domestic and international city paid support people. The whole concept looks typical Kennedy and highly suspect. Before any City resources are invested in this latest Kennedy effort, City Council and the Administration should ask what they are opening the door to. Do we really want every council member to have their own little political action group out there supported by staff? Maybe it would be a good idea if Council member Kennedy, caught up with the Neighborhood Associations in his District and started representing their interests. There is more than enough there to keep him busy. There is no doubt that Bill Edwards has a plan for Bay Walk. If you have any doubt drive by and note the construction. Recent history would indicate that Mr. Edwards approaches all of his projects with a plan in place and with well defined goals and objectives. With renovation of the facility, a strong marketing campaign and Bill Edward's reputation, new vendors and retailers should be easy to find. Bill Edwards is setting the stage to move the much touted downtown renaissance at least a block or two to the West. The much bigger question is what is the other Bill, Bill Foster doing? The Edwards design is configured to address some of the public traffic/protester issues but only the truly naive would believe that those who used Bay Walk as a stage for protest will not return. Then there is the whole issue of the sidewalk that the City deeded to the property. The key to Bay Walk, or whatever Bill Edwards decides to name it, is public safety. The list of retailers, bars or restaurants, can be award winning, but if the public does not feel safe they simply will not patronize the facility. Only the City can provide that feeling of personal safety. It would be nice to pass the buck on this one to the Bill Edwards team. Passing the buck is something this administration seems to be good at. Any security force the facility fields must be backed up by a City plan to protect the public. Mayor Bill Foster should begin now developing a plan. It is not too early. The current Police Department administration will trot out every excuse they can conjure up to limit their accountability for Bay Walk Security. The Mayor should pull together public safety people, parking, public works, sanitation and include the Bill Edwards people to look at the design and begin to develop a strategy that can be implemented with the grand opening and going forward. Forcing Bill Edwards to hire off duty police officers is not the answer. It might also be a good idea to talk to some of those who were the most vocal protesters at Bay Walk in the past and get their input and perhaps cooperation. Sticking your head in the sand and thinking these people do not have a stake in what happens at Bay Walk would be a big mistake. Bill Edwards has stepped up and is making a big investment and taking an even bigger risk. Mayor Foster needs to be proactive on this one. The City's record dealing with protesters and public safety at Bay Walk is questionable at best. With all of the other issues downtown, adding the new Bay Walk is going to be a public safety challenge. Mayor Foster needs to get a plan developed, bring it to City Council so they can provide for the cost now rather than later. One bad night, one event that scares the public and all of Bill Edward's money and effort can go right down the drain. Mayor Bill Foster needs to provide the leadership on this one. Is anyone watching the St. Pete PD Driving habits? The public has raised concerns about St. Petersburg police officers speeding and driving recklessly. During my five years as PD IT manager there were only two people authorized to access the GPS records for investigative data. Me and one of my supervisors. I did most of the data forensics including looking for officers or cruisers reported by the public for exceeding the speed limit. Speed data was fairly regular request. To get an idea of how many, I sent the following public records request to the Eva Andujar, City Clerk. The Internal Affairs cases are not classified by the breakdown listed in the request, but by allegation types to include as a sample Crash, Discourtesy, Discharge of Weapon, etc.. The information requested should fall under the allegation of Improper Procedures. To fulfill the request, a review of each case with an allegation of Improper Procedures would have to be completed to determine if the case was inclusive of the information requested. Staff has indicated there were 29 Improper Procedure cases in 2011 and 6 from January 1 - May 1, 2012. It is estimated that it will take approximately three hours to review the cases at a cost of $59.13. If you wish us to proceed, please make your check payable to the City of St. Petersburg and send to my attention at the address listed below. Please note that the cost of $59.13 is staff cost for review only and does not include redaction/duplication cost (a PDF copy can be created for the summary, but a request of the complete file would be in paper and possibly CDs if there were associated 911 calls/photos). Apparently the PD has no formal management report that details specific driving/speeding incidents, no formal reports detailing officer speeding, even though there are a number of complaints from citizens. Instead the information is buried in some broad report classification. It was always interesting to me that even though each cruiser is equipped with a GPS package that records all driving activity of every officer on every shift, the data was not routinely reviewed by any member of PD management for driving performance. It is going to be difficult to manage a problem like this if there is no detailed information going to the management chain. But then, if they don't ask for it they don't have to act on it. Work on the City Budget drones on as various groups stoke up on how they will try to affect the process. The Peoples Budget Review seems to be off to a good start. They are collecting a lot of information in their survey, and I am sure as long as the information backs up the City administration's plan it will be considered valuable. The special interest groups, like the arts council, the social service groups and neighborhoods are just staring to ramp up. So things are moving along at about the anticipated speed. The real yelling and screaming will start in a few weeks. It seems for the moment that the Mayor's center piece to solve the budget dilemma, is to raise the millage rate. Preliminary results from the Peoples Budget Review Survey seem to indicate that the people are ready to consider a tax increase to stop the erosion of services. I think they are just tired of listing to the Mayor and council members whine. The tendency in government is make the cuts where they have the most direct affect on the public. The theory is "let's put the pain where THEY feel it". You know, stop mowing the grass in the park, reduce the library hours, cut back on senior services... the stuff the public really feels. Share the pain. Problem is the only people who get a share of that pain are you. Before you whiz through that survey magnanimously offering to have your millage rate increased to "save" the City, think about this: the County wants to increase the EMS tax, the School Board is trying with all their might to hold on to an outdated property tax, St. Pete wants to raise your property tax, and there are probably a few others we haven't heard from yet. You could get a real surprise in the mail come September. One more thing. Never in the history of this County has a City government willing reduced its size or limited its spending. That is until the recession came along and the money dried up. Oh sure they want you to feel the cuts so you will do just what you're doing, agree to give them more money to spend. Try getting them to tie that millage increase to specifically keeping the libraries open, all the pools open, arts fully funded and some other specifics and see where that goes. It might not be that bad an idea to just let the boys at City Hall work this little budget problem out on their own. First, there is all that money in those reserve funds they are carefully protecting. For what? Then, there is still some room to cut over at Engineering, out at Storm Water, Economic Development, Business Assistance, we could use a little less management at PD, and the list goes on. But then YOU probably won't feel much of that pain. The opportunity to get City government downsized is right now. As the economy improves the opportunity will be lost. If you're willing to throw some more money at the current system, they are more than willing to take it and spend it.